The nature and natural phenomenon are overlooked in man-made city like Hong Kong, the beauty, mysteries and imperfection of such always inspire me to create. If I do not live in HK, I would not be thinking so much about the nature. Any specific element in the nature means a lot to you? I am very interested in lights – natural lights, artificial lights. I just care about it so much, I think light connects me with my mind and the nature. How did you begin your artistic journey? I began to paint when I was kid, and I am still doing it. It is easier for kids to paint freely and to express visually. I guess I am not the only one who fall in love with painting since childhood. Why did you stay in Hong Kong? I have been asked about this many times, I stay here simply because I like Hong Kong. I was educated in Osaka and first came to Hong Kong in 1994, I loved this place so much I had to come two, three times a year. So I thought maybe I should move here, and decided to live and work in this place. I feel good in Hong Kong, and made a lot of meaningful artworks here. 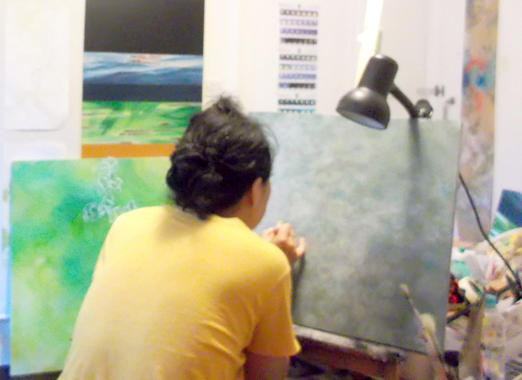 My works are created with acrylic paint on canvas, they are usually in abstract and I paint with flat-painting technique. I’m also trying to explore new way to make art with different materials and techniques. Please tell us a little about the current project. I am working on a body of works about time, moment and existence, while using the mirrors as the material. In the works, mirror symbolises ‘existence’. I am investigating the subject and trying to discover ways to represent my idea, and to shows ‘moments’.